If you think kurtis are boring, outdated or there aren’t enough styles and patterns to experiment with. Well, think again? 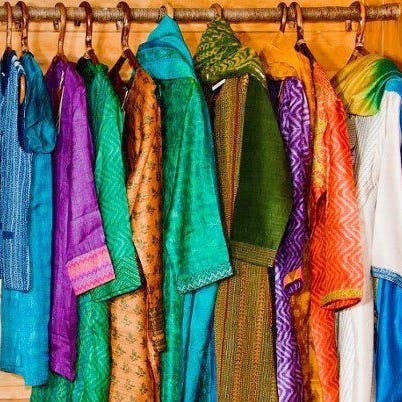 Here’s a list of stores in the city that may help you to break the style monotony of your kurti and make it a must-have garment in your wardrobe. Known for providing a variety of vibrant color shades, designs, patterns, prints, sizes and fabric, Rajkumar’s classy collection of kurtis, tunics and salwar suits will leave you spoilt for choice. Made out of the finest quality of cotton, georgette, chiffon, silk and chanderi fabrics, their unique designs can be worn both casually and occasionally. Make Zedd's your go-to place for Indian casual wear. The kurtis here are mostly in rayon and cotton featuring minimal embroidery and dual colours. Take your pick from short, knee-length or long kurtis that are straight fit, flared or asymmetrical. July offers you a rare breed of ethnic wear - one that is trendy, exquisite and oh-so-fashionable. Subtle tones in solids featuring fine embroidery that can be worn with shararas, palazzos or cropped pants. If you prefer the demure and elegant look over the bright and flashy, July is your place. Suti is synonymous with the comfort and versatility of cotton. Their kurtis have the ability to make you feel at home while also making you stand out in a crowd. Perfect for when you want to dress semi-formally and yet be as comfortable as though you are wearing t-shirt and pajamas! They have Indian and fusion wear to suit all occasions, body types and pockets. Simple. Basic. Rustic. Earthwear lets you embrace comfortable fashion with their range of handcrafted cotton and silk kurtis accentuated with traditional block prints and light embroidery. Their colour pallete consists of soothing hues of white, blue, green, ochre and pink. If you are someone who likes to keep it simple yet turn heads with your simple style then Bharat Fashion should be right up your alley. Their range of beautiful kalamkari kurtis and monochrome silk kurtis are to kill for. You can even match your monochrome outfits with gorgeous chanderi and cotton indigo print dupattas. Don’t forget to check out their charming collection of shirts for men, which go really well with dhotis. Rene stocks all kinds of kurtis, from casual to party wear in khadi, handloom, silk and cotton. Pick from embroidered, prints or monochromes in mesmerisingly rich colours like rose gold, mauve, turquoise and emerald. Poshaak is known for their beautiful kurtis with all kinds of block prints and applique. Be it straight-fit, asymmetrical or flares, choose from the wide range on offer in bright hues. Apart from their own brand, Poshaak also curates apparel from brands such as Seasons, Sampada, Suvasa and Kilol. If you wish to make a statement like one of your favourite Tollywood stars, head to Mahi of Kolkata. This boutique has a wide range of ethnic collection mostly in bold colours with patterned chanderi and cotton. The kurtas, tunics and fusion wear is supremely classy and unbelievably affordable.